This topic contains 0 replies, has 1 voice, and was last updated by ricky 1 year, 1 month ago. Our Angel of War and Peace “Bismark”, his palm-leaf turns into a Quill, “the pen is mightier than the sword”. The EU Secretary-General Martin Selmayr is replacing Jean-Claude Juncker’s departure next year. 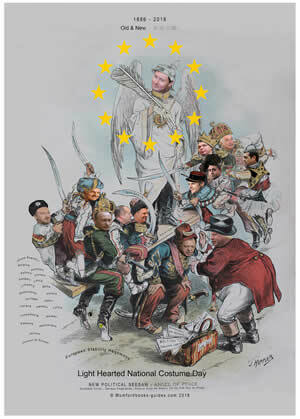 Our Council of Europe SeeSaw heads of States: Austrian President Alexander Van der Bellen, Serbian Aleksander Vucic, Greek Alexis Tsipras, Italian Luigi Di Maio, French Emmanuel Macron, John Bull Boris Johnson, Turkey Recep Tayyip Tayyip, Bulgaria Rumen Radev, Roumania Klaus Lohonnis, Russia Vladimir Putin, Montenegro Milo Dukanovic, Bosnia Herzegovina, Bakir Izetbegović.